I'm not a man hater. (This is the part where trolls will foam at the mouth because YER A FEMINIST, YES YOU DO HATE MENZ.) But seriously...anyone who actually reads what I write or knows me "IRL" can tell you that I am definitely not a man hater. That aside, I'm not ashamed to say, I sure am getting tired of hearing white male opinions this week. And by week, I mean IN LIFE, but you know, this week particularly. Let me just run through a few gems. 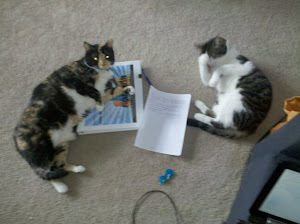 1) "Binders of women." I don't think I need to tell you where that came from. Mitt Romney, and basically everything he said about women at the debate on Tuesday night, was some of the most uninformed mansplainey garbage I've heard in years. "Hey, Mitt, how will you ensure equal pay for women?" "Oh, I hired a woman once. And I made sure she could get home in time to cook dinner!" David S. Bernstein (another dude, yes, but one who gets it) said, "note that in Romney's story as he tells it, this man who had led and consulted for businesses for 25 years didn't know any qualified women, or know where to find any qualified women. So what does that say?" 2) "You don't have a right to equal pay." Let's turn to a microaggression I encountered this week. A dude wrote this on a friend's Facebook status when she posted a reaction to the debate. Part of me kind of just wants to let those words sit there in all of their own ignorant glory, but instead, I'll go ahead and explain that we actually DO have a right to equal pay for equal work. Anything less is discrimination and is actionable by law, you insufferable fool. Now one might, in their own pea brain, feel that women SHOULDN'T have the right to equal pay. But that is one's own ignorant opinion and is not supported by law. And guess what? You don't get to declare your ignorant opinions as fact. 3) "What about the Democrats' war on men?" Now that I've collected myself again, let me explain where this came from. On NPR this morning they were previewing a segment with student voters and a woman brought up that she felt that Republican policies were detrimental to woman and a male student replied with this glistening piece of fail. First of all, let's clear one thing up right now: Policies which help a disadvantaged population or limit the privileges of an advantaged population are not equivalent to war. When Democrats demand things like legalized abortion, affirmative action, or the end of pay discrimination, they are not persecuting men, they are helping women and people of color. On the other hand, when Republicans think the government should be so big that it goes inside someone's uterus, well, I can't help but feel a bit persecuted. I'm not saying that the "war on women" imagery is a perfect talking point, but when you learn that Republicans in your state are cutting the funds which provided 130,000 well woman exams, it starts to feel pretty appropriate. What is war if not inflicting death and injury on another group? And what can inevitably lead to death and injury? Hmm, I don't know, maybe inadequate healthcare and no access to preventative screenings. I just don't see the same thing happening with Democratic policies toward men. Besides, it's amazing to me how every time a woman voices her concerns, some guy has to stand up and yell, "What about the men?!" Seriously? Are we not paying enough attention to men already? Stop acting like women aren't heinously underrepresented in the media, politics, and leadership positions. Just because I feel like this disclaimer needs to be said...men, I'm clearly not talking about all of you, so if it's not about you don't make it about you. But as a general rule, I think the political world would feel less hostile to women if most men would learn how to engage in feminist discussions. But asking for feminism to be main stream is pretty much a pipe dream, hence the entire reason for why I write. 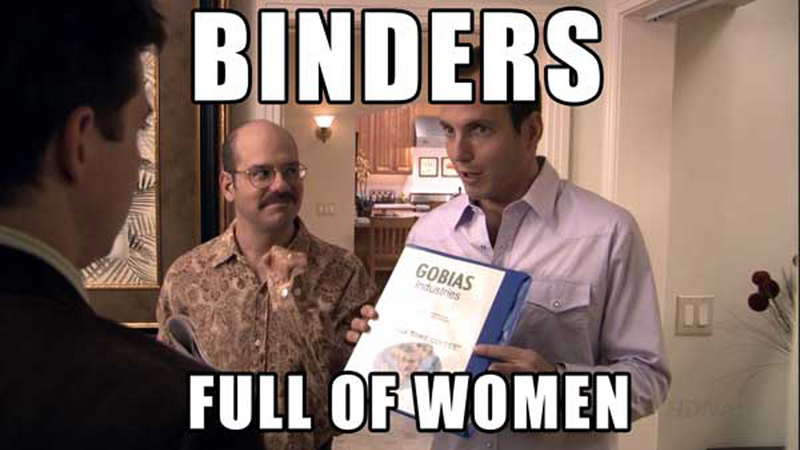 At the very least, I'm happy to see that ole Mitt is getting widely roasted for the binders comment. "You don't have a right to equal pay." Hrm. Then I guess no one else has the right to expect that I engage in equal work. From this point forward, I shall be taking every other Friday off.